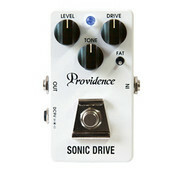 De SDR-4R is een super transparante en lichte overdrive. It was one of our most popular overdrive pedals that lasted until version 5. We are excited to reissue the SONIC DRIVE this fall as SONIC DRIVE SDR-4R for a limited run. Based on the old SDR-4 which was the most praised version, we retained the circuit that affects the sound while using the current parts in the market. A full and vibrant sound can be realised without being masked by the sound of other instruments in a band environment.